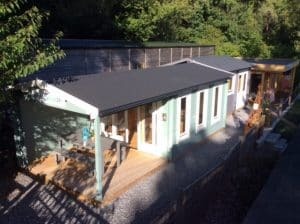 Earlier this year we installed another three cabins on our display site in Totnes (Devon) and have completed painting, roofing and decoration works as well as furnishing. The display area and cabins are really looking great. We are excited to show our customers these five very different garden buildings with different wall thicknesses, cabin features, glazing options and roofing types to show examples available for very different reasons and uses. 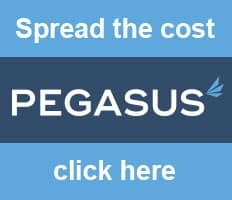 Our display site in Totnes is situated in South-West of England, and just within a 40 minute drive from Exeter, Plymouth, Exmouth, Torquay, Newton Abbot, Paignton and Ivybridge. 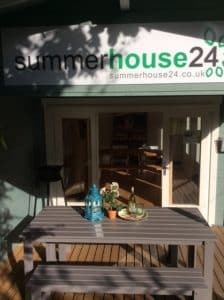 Potential buyers of garden rooms, BBQ huts, sauna cabins and other garden buildings from Taunton, Oakhampton, Truro, Southampton, Bristol and Bath can reach us in just a two hour car ride. Our professional and friendly staff are available to welcome you seven days a week. Garden room with veranda Eva E is one of the most popular garden rooms among our customers. 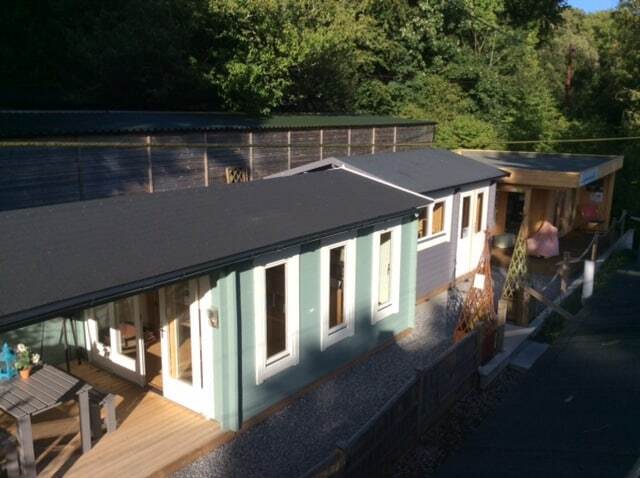 This is a typical 44mm garden building with large veranda, 28mm terrace decking, sliding doors as well as double glazed windows with German made Roto turn and tilt systems. For the roofing of that cabin we used extra durable and premium quality roofing shingles from Icopal Finland. The Hansa Lounge XL is a top choice cabin for people who are into building a garden office or a garden room for all year round use. Standard cabin kit includes 44mm wall planks, double glazed doors and windows, all other wooden cabin components made of Nordic spruce, metal strengthening rods in walls and all fixings. For all year round use, cabin roof and floor must additionally be insulated and light heating for colder months installed. An insulated cabin also requires additional EPDM or Firesmart roofing, to ensure safe, durable and water-proof cover on top of the roof insulation. 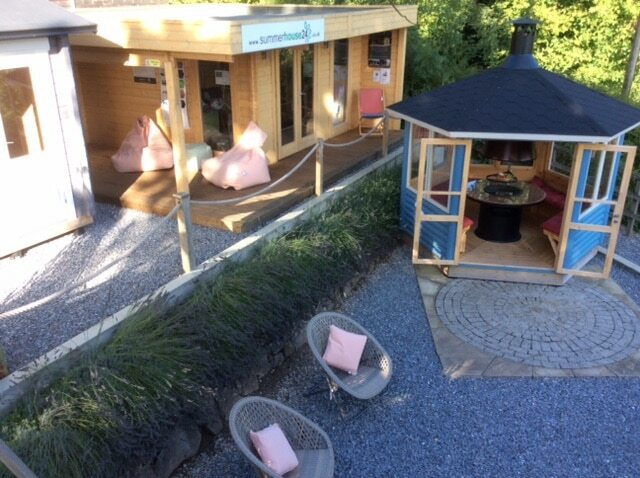 Sauna Cabin Finland demonstrates all our standard sauna cabin features as well as extra thick 70mm walls that we also use a lot for large garden rooms, offices and even for large one- two and three bedroom cabins. This sauna cabin also demonstrates EPDM roofing. Seattle S is our bestselling BBQ cabin. You can view the overall cabin quality as well as Finnish made premium quality grill, chimney set and granite table fitted around the fire box. Our BBQ huts and grills are among the best, if not the best, you can buy in the whole UK. 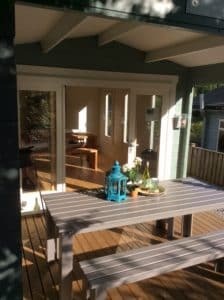 Anita garden summer house is the first cabin we installed nearly four years ago. 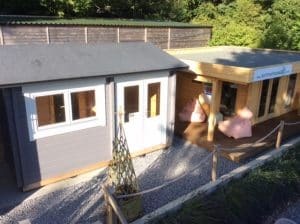 Although 28mm garden buildings are the most affordable ones in our cabin range, with good installation and proper care they still last long and looking good for years to come as our Anita cabin shows. These 28mm garden buildings are widely use as small 2x2m and 3x3m garden summer houses, kids playhouses or storage sheds. All our 28mm and 40mm garden buildings come with single glazed windows and cabins with 44mm and greater wall thickness have double glazed doors and windows in the standard cabin kit.